Fantastic stay in Marrakech with great hosts. Very good breakfast Great location with a lovely Riad Highly recommended! 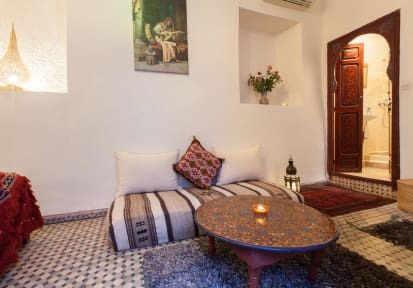 We had some very nice days at this beautiful Riad. The staff is very kind and warmly welcomed us. We directly felt at home. They also gave us some very useful tips to get around in Marrakech. You get a great value for the price. The breakfast is very good and you can also order some food there which is also delicious. Overall a great experience! We would love to stay there again. Our stay at Hna Ben Saleh couldn't have been better. The rooms are very beautiful! Aymen and the other stuff are super nice and helpful. The breakfast is also very good, we would definitely stay there again! ++It was the most clean place we stayed in Morocco (we stayed also at 5 other hotels). Great ready. Really kind staff and a very good service. We total enjoyed the time there. You can ask for everything and they try to help you. The roof terrace is also very nice. Die Mitarbeiter und die Sauberkeit war einbahnfrei.Den Weg nach Hause muss mann sich halt gut merken wie überall in Marrakesh ,sonst verläuft man sich.Weiter zu Empfehlen!!!! Obwohl das Hostel mitten in der lauten Medina ist, ist es absolut ruhig, hat schönen kleinen Empfangs-Aufenthaltsraum, hat tolle Terasse auf zwei Ebenen, je nach Wetterlage kann man da in der Sonne oder Schatten frühstücken. Es gibt superfreundliche Mitarbeiter, die einem jeden Wunsch erfüllen. Goldbarren würde ich aber nicht auf dem kleinen nicht richtig absperrbaren Zimmer lassen, sondern an der Rezeption zur Verwahrung geben. Great Experience! Cosy Hostel, very friendly and helpful Staff and nice Breakfast. 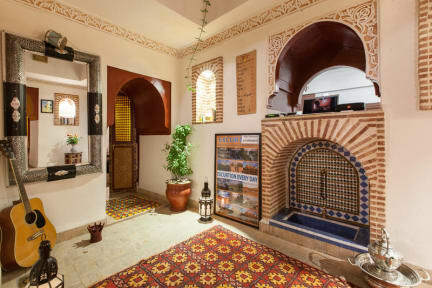 The Hostel is centrally located but has a totally calm and relaxed atmosphere. Thank you for the nice stay, Aymen and Hamid!